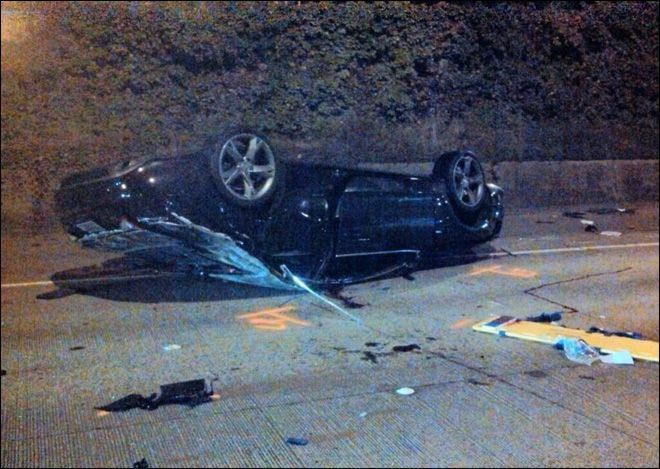 Officials with the Washington State Patrol (WSP) say that excessive speed was likely a major contributing factor in a fatal single-vehicle rollover collision that occurred on a freeway in Tacoma Monday evening. According to Trooper Guy Gill of the WSP, police officers responded to reports of a serious motor vehicle accident at southbound Interstate 705 near the South 21st Street exit in Tacoma at approximately 7:10 p.m. Monday and found a black 2008 Audi resting upside down. The driver of the black Audi, who has not yet been identified, was pronounced dead at the scene. Police say their investigation suggested the driver was driving southbound I-705 near in Tacoma at approximately 7 p.m. and attempted to exit at the off-ramp of South 21st Street. Investigators believe the vehicle failed to make the full turn to the exit, causing the vehicle to lose control and cross a traffic island onto State Route 509. Police believe the car continued on across SR 509 and eventually crashed into a jersey barrier, which launched the car over the roadway. The vehicle eventually came to rest on its roof, which can be seen in the image above. Emergency responders reportedly had to extricate the driver’s body from the car after the car crash occurred. This is common in crashes where the vehicle involved has rolled several times or landed upside down, because the interior of the vehicle can collapse and trap drivers and passengers inside. It is unknown if the male driver was under the influence of any drugs or alcohol at the time of the accident, and police will likely provide further information regarding any additional contributing factors as the investigation progresses. Speeding, especially during the fall and winter months in Washington state, is a fairly common factor in both single-vehicle and multi-vehicle accidents. Witness statements will also likely be valuable to the police officers’ investigation into the crash, as there will likely be a few other motorists who witnessed exactly what the vehicle was doing before the driver lost control.